So yeah, Louche. A newly discovered and instantly beloved clothing and accessories goldmine. I mean, c'mon: the line includes a striped sweater with a big ole' strawberry right smack in the middle. Louche is an independent boutique label available exclusively at the UK-based Joy. Shop the goods online right here. No, but seriously, you guys, the strawberry sweater. Can't stop thinking about it. I love that bracelet. So delicate! Great finds. I had never heard of it so I appreciate the heads up! Excellent find! 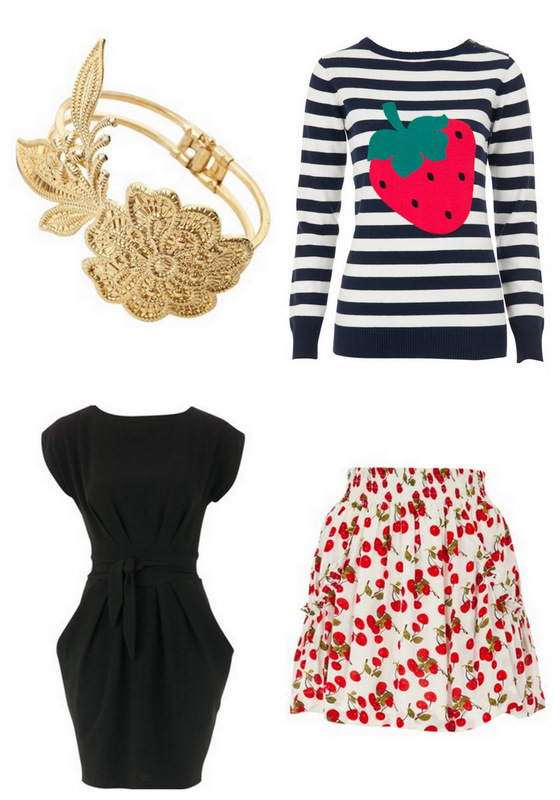 I'm digging the bracelet and black dress...and you're right, the strawberry sweater too. LOVE this find. Their dresses are amazing. Thanks for introducing this store to us! Never mind the sweater... I am in love with that skirt!!! So cute. PS: I will totally be your preschool president if you'll be my preschool's teacher! Oh my goodness, this is pretty amazing. That giant strawberry is irresistible! Love all of these! That dress is so classy & fancy! And that sweater might as well have your name written all over it! P.S. I'm looking forward to that bread post! love that strawberry shirt. too cute! I just discovered your blog today, and I'm so glad I did. Lots of fun links around here! Love the strawberry sweater! I love all these pieces really, so pretty and fun. Off to check out their shop now! Amanda, thank you so much for stopping by! I sure hope you find some lovely reads through the blogroll. There's certainly oodles of inspiration out there!